When we woke up this morning, there was no such thing as Far Cry: Primal. What we had instead was a Ubisoft YouTube stream teasing some sort of announcement by (very) slowly panning out to reveal an assortment of cave paintings. Inevitably (this being Ubisoft) the news leaked within hours—in this case via IGN Turkey’s Twitter account—that the game in question was Far Cry: Primal. We still don’t know much beyond the image above, other than that the game seemingly takes place in a prehistoric era and will feature early man presumably doing Far Cry things like climbing, shooting, knocking over the ancient equivalent of outposts, and skinning animals. But having so little to go on sparked our curiosity, igniting our hot takes on exactly what Far Cry: Primal might entail. Help us fill in the gaps in the comments. Far Cry: Primal is going to be like ARK: Survival Evolved for earnest but out of touch parents. ARK is a misunderstood and maligned game from those who don’t ‘get’ the survival genre and thrill of Early Access patch-surfing (me), but it throws the player into a sandbox full of dinosaurs. I think the appeal is the possibility, not necessarily the second-to-second play. My guess is that Far Cry: Primal will likely be a good Far Cry game, in that it puts you in a different sandbox, gives you some fun tools, some dangerous variables (dinosaurs, mammoths? ), and says go. I just can’t help but think of the mismatched expectations and ensuing conversations a few families will have. Moms and Dads, latching onto a thing they can finally connect with their #teens through. It has cave-folks, jungulature, survival? I’m hip, good, happening—right? But then young Sally or Jimmy asks why you can’t collect your poop and save it for later and you’re back to square one. Not for the first time today, I’m confused. My initial reaction from the art was that Far Cry: Primal is going to be an Open World version of Mel Gibson’s Apocalypto. And if so, okay, I guess I’m in. (Although for maximum artsiness, I would have prefered the Aztec bits from The Fountain as inspiration.) Having looked at it properly, now what I want to know is whether Primal is set entirely in ye olden cavetimes, in which case does that mean there are going to be no guns at all? If so, hmm, maybe I’m out. Without wanting to come across too Chuck Heston at a ‘git gud with guns’ mixer, my favourite part of Far Cry 3 was collecting all the signature weapons. I’m not sure a signature sling shot would be quite as compelling. Unless maybe you’re a time traveller or something, and the game is a riff on the hella popular survival genre, but only your character is allowed to have high calibre weaponry. In which case: definitely back in. Judging by the single screenshot that we’ve seen, apparently Ubisoft has found a way to make ‘the oppression of a group people’ into a theme again, which will be a bit disappointing to me if it happens to be true. ‘Liberate a bunch of outposts and similar things on a map’ is fun enough as a template, but this dive deep into human history is a huge opportunity to explore new structures. That’s my main hope for Primal: that it’ll be much more than Far Cry with a fancy melee system. Traversal is a big question for me, too: if dinosaurs aren’t a thing, I have to assume we’ll be exploring on horses (which were being used to drive chariots as early as 2000 BC), but god, I also hope it’s dinosaurs. Pterodactyls are nature’s hang gliders, after all. All I know is that if I can’t ride a dinosaur I will be severely let down. When Ubisoft’s cave art teaser video first went live, it got me excited at the potential of a big budget dinosaur game, but the leaked image above and the ever expanding wall of art is making me lose hope for my stego-riding dreams. Ignoring the fact that cavemen never actually lived with dinosaurs, the characters in the teaser image look like they come from a later time period than the dinosaur taming type. 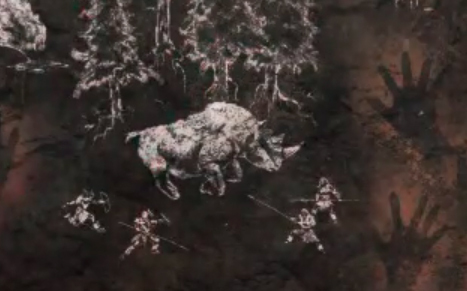 Another shadow cast on my hopes takes the form of a rhino, now visible in the reveal video. Why would they be hunting rhinos when they could be hunting dinosaurs? So my prediction, as much as it pains me to make it, is no dinosaurs. I sure hope I’m wrong.